Fat Girl to Thin: TGIF!!!!!! 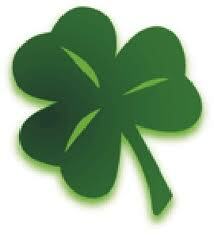 And I hope you all enjoy the nice little shamrock today. I don't really understand this holiday but I love the Irish so we celebrate. When I was in college I did a mini-mester in Ireland so my blood flows green on this holiday. Already today I have received a green bead necklace (and no I did not flash anyone) and a green newspaper. And its just Friday....wonder how many fun things we can make green tomorrow? I have been catching up on my blogs today and everyone keeps talking about how quick this week has gone by....Are they CrAzY!?!?! I'm so happy to see Friday! I must say I'm in a great mood because its Friday but also because I got a full nights sleep last night. I don't think I even rolled over, and I desperately needed that. I got a good nights sleep, and already did my INSANITY workout this morning so another night off. Today was my fault that we had to go early, I have a ballgame to go to this afternoon and I have only been to one game so far, I need to go to this one. I already decided that if I get home in time I am going to the gym to swim. I have beaten my body up for 2 weeks now and as much as I like the fact that I can already see some results in my stamina (not my pants) I am really craving a low intensity, low impact workout. Tomorrow's INSANITY is the recovery workout so even if I don't get to swim tonight I might take a dip after tomorrows workout. It may say recover but it is not easy by any stretch of the imagination, but its easier than others. Today, Friday, is my favorite food day. I designated this my cheat day within reason. My true cheat day is on Sunday but on Friday morning I stop and get a breakfast biscuit. It is rare now that I stop but Fridays, I look forward to it all week long. That's really the only splurge I get of Friday. And sad news on the food and drink front. I have had coffee this week. I cut it out at the beginning of the year when I gave up my diet drinks again. The doc told me to get off caffeine and acidic drinks. Well I did good once I got the caffeine out of my system, but this week I really wanted a glass one morning (the smell was intoxicating), yum... But it didn't last long. 3 days of coffee and now upset stomach. It really is a sad day! I kept hoping it was something else that hurt my belly but no! Oh...I am so ready for the weekend. I hope you all have a safe and HAPPY ST. PATRICK'S DAY!!!! !